Even though I currently call the Mile High City home, I was born and raised in Tampa and am a Florida girl at heart. During a recent trip home, I decided to take the kids and return to the site of so many of my fond childhood memories - Busch Gardens. The park opened in March of 1959 and was originally a hospitality facility of the Anheuser-Busch brewery. Busch Gardens was free to enter and guests(of drinking age) received free samples of beer to enjoy in a beautiful garden. I guess free beer wasn’t enough, so Busch Gardens continued to grow throughout the years, adding rides and attractions, including opening the first inverted roller coaster in Florida in 1976. Busch Gardens now has more than 20 rides and sprawls across nearly 335 acres. If you are planning on visiting Busch Gardens, plan on spending the good portion of a day. We were able to cover almost everything in a leisurely day. Here’s what you can expect. Busch Gardens is a fun amusement park with something for everyone. I’ve separated attractions by personality so you can see what’s available for the thrill-seekers in your family, and for those a little more concerned with personal safety. Oh, and a section for toddlers, because we all know they live on the edge anyway! If you have a little one, the Sesame Street Safari of Fun is a must see. The Safari offers hours of fun in the Florida sun with your favorite Sesame Street characters. This area is great for those between the ages of 2-6. Nearby you will also find Jungala Treetop Trails, a high-flying playground full of climbing ropes, splash pads and several rides suitable for the kids. If you have a thrill seeking teen/tween (or Grandma) then Busch Gardens is the place to be. There are 6 heart-stopping rides that go upside down and turn your stomach inside out. One of our group’s favorite rides was Busch Garden’s newest roller coaster - Cobra’s Curse. The ride queue is elaborately themed and mostly inside(FL heat + A/C inside queue = happiness for all). And of course, what would be a snake-themed ride without live snakes? Yes, there are live snakes in the queue…so if you have Ophidiophobia(that’s fancy talk for snakes-make-you-pee-your-pants), this ride may not be for you. TWO SCOOPS TIP: The queue can be extremely dark at times and has a little show mid-queue that may scare some younger kids. Cobra’s Curse is a fun, thrilling coaster that does not invert. This is a unique coaster as there are live Cheetah’s near the entrance of the ride that will run back and forth. Imagine yourself as a Cheetah as you race and weave through the park on this exciting roller coaster. Can you outrun a Cheetah? Sheikra was Sydney’s favorite coaster. 200 foot-drop, 70 mph coaster that ends in a splashdown - what’s not to like? For an extra thrill, ride in the front row. For those in your group who avoid living on the edge, Busch Gardens offers several interesting shows, well-designed animal habitats and even a few rides for those faint of heart. Ubanga-Banga Bumper Cars - You guessed it. You bang, they bang, we all bang together. Congo River Rapids - An exciting journey through the rapid - you will get wet - bad day to wear white shorts. Sandserpent - A fun, twisty little coaster that has a bit of thrill without the intensity of the other roller coasters. This really depends on your family. My mother is nearly 70 years of age and will ride even the scariest coaster like a boss! So depending on your family, you may have a different idea of family friendly rides. Skyride - enjoy arial views of the safari and park as you ride to/from Edge of Africa to Stanleyville. Serengeti Express Train - Rides through the animal safari area and has few stops around the park (Nairobi, Congo and Stanleyville) to relieve those tired feet. Shows vary per season and are updated frequently. 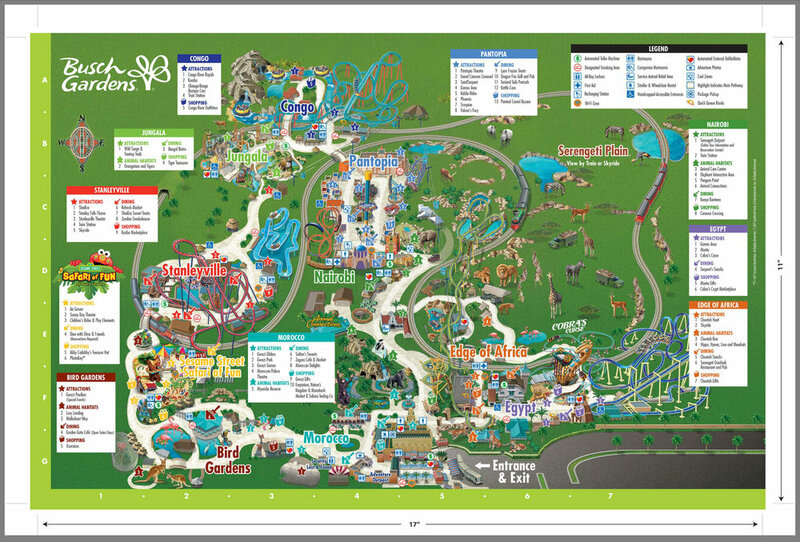 We recommend you check-out the schedule on the back of the park map upon arrival for show times. During our visit in March 2018, the headlining show was ‘Turn it Up’ in the Moroccan Palace, a dazzling ice skating show featuring aerial acrobatics. Do you want to sing and dance while enjoying lunch or dinner? Then you have to eat at the Dragon Fire Grill restaurant, which features live performances on stage as part of the‘Rock-a-Doo-Wop’ show. ‘Opening Night Critters’ in the Pantopia theater is a comedy skit with live animals. Now who doesn’t find that fun? If you have budding zoologists in your clan, check out one of the many animal experiences that Busch Gardens has to offer. Animal Care Center - An enclosed observatory where guests can view Wildlife Docs at work and learn the importance of caring for our animal friends. During our visit, surgery was being performed on an poor owl involved in a hit-and-run. Animal Habitats are scattered throughout the park allowing you to enjoy nature at every turn. These habitats feature alligators, cheetahs, elephants, flamingos, penguin, birds, chimpanzees, gorillas, tigers, giraffe and hippos, just to name a few! Guests can travel ‘down-under’ and get up close and personal with some of Australia’s famous inhabitants. A highlight of our visit was feeding the kangaroos and wallabies at Walkabout Way and the lorikeets at Lory Landing. It’s nice to know I’m not the only one who doesn’t like salad everyday! When your roaring like hungry lions, Busch Gardens has several dining establishments to choose from. During our visit, we chose Dragon Fire Grill, a multi-cultural grill with something that appealed to everyone. For a full list of Busch Restaurants, check out their interactive park map. WHAT YOU GET: Up to one entrée(kids must get kid’s meal), one side item or dessert and one beverage(soft drink or bottled water) once per hour at any of the following locations: Zagora Café, Serengeti Overlook Café, Kenya Kanteen, Sheikra Eats, Bengal Bistro, Dragon Fire Grill and Zambia Smokehouse. Buy One, Get One Free on all items at Serengeti Overlook Restaurant. Excluding mixed alcoholic beverages. Pass Members save 10% on this product. FINE PRINT: No sharing. No souvenirs. Look for colorful dots to identify items included in the Deal. Not valid on Food & Wine Festival samples, during Howl-O-Scream or the Serengeti Overlook™ full-service restaurant. Not for resale. Nontransferable. No refunds on day of use. Refundable any time prior to the day of admission. There are several hotels in the area. The negative to this location is that it is in town and there is not a lot of things to do after you finish Busch Gardens. That is why I personally don’t recommend staying in this area. I prefer to stay on the beach on the Gulf side, with Clearwater Beach or St. Petersburg being my favorites. Orlando is also a great option. Both are about an hour’s drive from Busch Gardens. GENERAL PARKING: $20(this lot is FREE for Annual Pass Members). Cars, motorcycles, trucks, recreation vehicles and campers allowed. PREFERRED PARKING: $26($13 for Annual Pass Members; FREE for Platinum Members), lot is subject to availability. If you are staying in Orlando and want to make a day trip to Tampa, good news! You don’t have to drive yourself! Mears Destination Services offers round trip motor coach transportation from several convenient Orlando area locations to Busch Gardens Tampa Bay. Transportation is complimentary with any purchased Busch Gardens admission ticket. Reservations are highly recommended, due to demand. Number of stops for each shuttle are not determined until day of trip. Your shuttle could potentially have a maximum of 3 stops on the route. For additional information, including pickup time and locations, please call 1-800-221-1339 or visit Mears Destination Services. Open 365 days a year. Hours vary by season. Busch Gardens has special events that take place all year long. Holiday events such as Howl-O-Scream, Independence Day Fireworks and Christmas celebrations. In addition to holidays, there are seasonal events such as Food and Wine and Bier Fest. Concerts, Kids weekends, and famous meet-and-greets also happening. What’s nice is that the majority of these events are included in your admission ticket! Check out their events page for more information. More options available online. We recommend purchasing tickets online to save money. Busch Gardens also offers their version of a FastPass with their Quick Queue. This add-on allows guests to, you guessed it, skip the lines at the most popular attractions. There are two tiers to the Quick Queue - single-use and unlimited. WHAT YOU GET: Single-use front-of-the-line access to Falcon’s Fury, Cheetah Hunt, SheiKra, Montu, Kumba, Cobra’s Curse, Scorpion, Stanley Falls Flume, SandSerpent & Congo River Rapids. FINE PRINT: Seasonal pricing applies. Pass Members save 10% on this experience. WHAT YOU GET: Unlimited front-of-the-line access to Falcon’s Fury, Cheetah Hunt, SheiKra, Montu, Kumba, Cobra’s Curse, Scorpion, Stanley Falls Flume, SandSerpent & Congo River Rapids. FINE PRINT: Limited availability. Seasonal pricing applies. Pass Members save 10% on this experience. News flash: Bags are not permitted on any attraction at Busch Gardens. Unless you have stroller-pushing-sister or Grandpa agrees to be the Designated Bag Holder, plan on renting a locker to store your stuff. You have three options: rent a locker at the front of the park(not very convenient), rent a locker at each ride(convenient but cost adds up) or leave your bags with Grandpa. My advice is to bring Grandpa! Single-Use / Short-Term Lockers: At entrances to the following rides, key pad operated lockers available for short-term rent. One-time use locker pricing: $1.00 for the first two hours, and $2.00 for each additional hour, with a $20.00 per day maximum. On this visit we were blessed to have a multi-generational group from toddlers to teens and, of course, Grandpa! Within that group, we had every theme-park-personality imaginable. Overall, our entire group enjoyed spending the day together at Busch Gardens Tampa Bay. The park is well laid out with activities for a variety of ages and interests. Our more sensible tween, Holli, and Grandpa decided upside down wasn’t an option for them. So they strolled the park and enjoyed the scenery and animal experiences. Our thrill seekers, Sydney and Jayce, unanimously agreed their favorite rides were Cobra Curse and Sheikra. When planning trips that include teens, don't forget to allow for either a late start or some down-time/wifi-time during the day. What is your favorite Busch Gardens memory? Ready to plan your family vacation to Orlando?